James Hill getting ready to start the annual Turkey Trot. November is a special month on the Trinity campus. The fall semester is winding down, and many of the University's major fall events are now fond memories. In a few days we will celebrate Thanksgiving—a time for expressing gratitude, appreciation, and caring for others. I am grateful to be a member of a University community that is generous and giving of their time and resources to ensure that Trinity's students have what they need to be successful in their education and in their careers. I am grateful to be associated with a University community of loyal and supportive alumni. We recently held Trinity's 1869 Challenge, in which records were broken. Through the generosity of Trinity's faculty, staff, students, parents, alumni, and University friends, we raised more than $500,000 in 1,869 minutes. Thank you to all who donated not only monetary contributions, but also time and volunteer hours to help make this event a success. 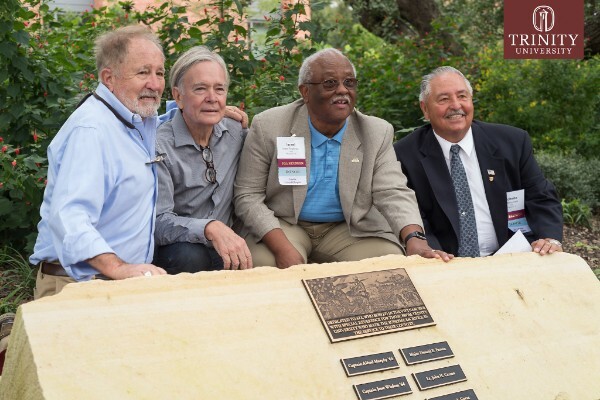 Erich Menger '66, Jerome R. Schmidt '68, Israel P. Anderson '68, and Roberto Valle '68. In October, we dedicated Trinity's Vietnam War Memorial as an inspiration for our current students to remember those who courageously served in our armed forces during this conflict. This campaign was initiated by Miles Cortez '64, who completed his ROTC training on Trinity's campus and served in Vietnam after graduation along with other Trinity graduates. Cortez, now a member of the Trinity Board of Trustees, wanted to honor two of his classmates, Jesse Wisdom '64 and Al Murphy '64, and other alumni who gave their lives during the Vietnam Conflict. Cortez believes it is important for today's students to recognize the contributions that these individuals made, and for that we are also grateful. Also in October, Alumni Weekend brought hundreds of Trinity friends back to campus for a weekend full of memorable events. Alumni and families enjoyed special dinners and award presentations, attended open classes and department reunions, met future alumni, and toured the campus. 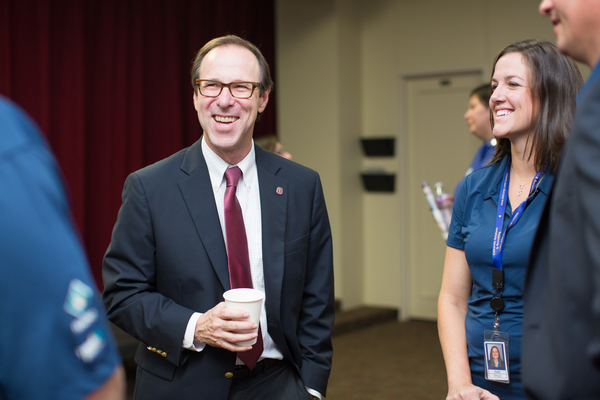 An event that I especially appreciated was our "Fiesta with Faculty," which reconnected alumni with the professors who inspired them to reach higher and who they now thank for their successful lives. These connections remind us that that we must keep an eye to the future, even as the work of today commands our immediate attention. The value of a Trinity education is realized in lifelong connections, and we must endeavor to innovate and excel in whatever tomorrow brings. To achieve this, we will continue to invest in a strong foundation of faculty and staff and and to listen carefully to the diverse voices of our University community. 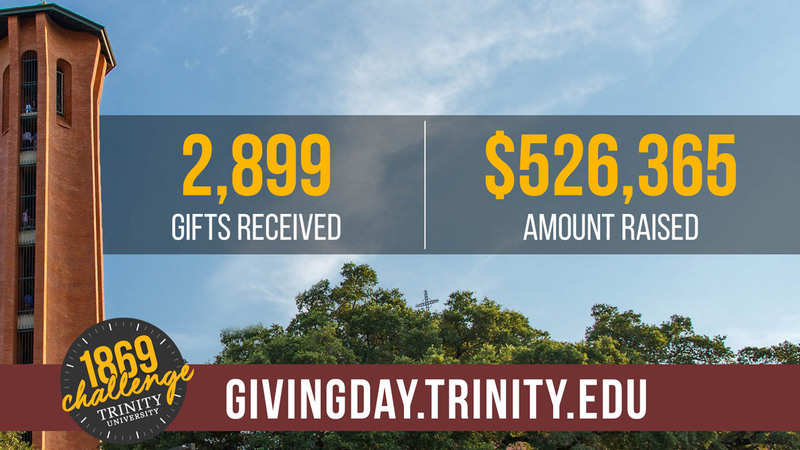 Finally, I want to thank each of you for your continued support of Trinity University through your generous contributions of time and mentorship, which are also essential for our students to discover, grow, and become visionaries to make the world a better place. Here’s wishing you a blessed and happy Thanksgiving.